The Mediterranean monk seal’s are the most critically endangered of all sea mammals are a re believed to number as low as 400 – 500 individuals and still declining. The Monk seals are under threat in a variety of different which all stem back to human presence. Although the Monk seals have been hunted throughout time for valuable resources such as oil, blubber and fur the Monk seal species was thought to be stable up until the middle ages where mass hunting severely damaged the population. Today the Monk seals are under threat due to loss of food because of excessive fishing and even persecution by fishermen due to the Monk seals being seen as competition for fish. The Monk seal gets its name from its brown coloration which was compared to that of the robes of ancient monks although older males of the species tend to lean more toward black than brown with all Monk seals sporting a much paler gray color underside. The Monk seals were once common throughout the black sea, Mediterranean and the north western coast of Africa however the population is not limited to scattered groups across the Mediterranean sea with the black sea population presumed to be extinct. The preferred habitat of the Monk seal is that of warm coastal waters and it is in these waters the the Monk seal will spend the majority of its time. Although it is now common for the Monk seals to breed underwater or in secluded beaches and underground coves the Monk seals were thought to have previously moved on land to breed only changing their methods in recent years due to increased human presence. The average lifespan of a Monk seal in the wild is thought to be anywhere between 20 – 30 years with sexual maturity developing around the age of 5 or 6. 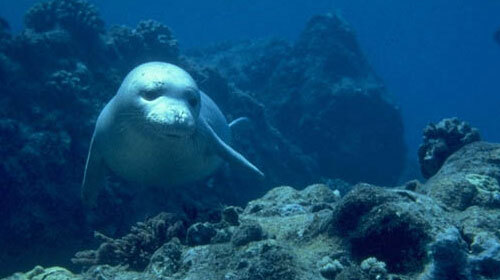 The Monk seals spend their days foraging for food in the warm shallows, with a diet exclusive to fish and cephalopods. What was once an abundance of food has been severely reduced due to over fishing in the area. The Monk seals have a slow breeding pattern and the after successful mating the females will go through a period of 11 months gestation before giving birth. The young seal pups are generally weened off by their mothers at around 4 weeks however its not uncommon for the pups to stay close for up to 3 years or more.